MSC Cruises offers its guests a mediterranean and modern lifestyle at a good price-performance ratio. On the sometimes colorful, sometimes discreetly designed ships, guests of all ages feel comfortable. In the summer months, many families are on board, especially at Mediterranean cruises, many Italian families spread Italian cheerfulness. In the off-season, it is a little quieter, then many older guests come on board, to experience a cheap cruise. The ships also arrive well in the German market and the number of German guests is growing steadily. 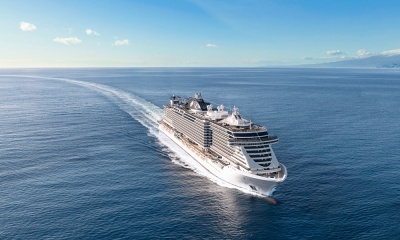 The ships of the MSC fleet take with double occupancy between 1500 and 5700 passengers on board. English skills are recommended, but you also get some German service on board. The MSC Virtuosa is the newest high-sea cruise ship from MSC Cruises and cruises from November 2020 to the most beautiful destinations of the mediterranean. It is a sister ship of the MSC Grandiosa and also a member of the Meraviglia Plus Class. This means amongst others that its public domains offer more space. Besides, the MSC Virtuosa surprises you with two new and first class shows from cirque du soleil at sea. MSC Virtuosa offers you a variety of different staterooms and suites, including amongst others family staterooms, maisonette suites with own whirlpool, seaview staterooms, single staterooms and many more. The size differs depending on the stateroom category from 12 to 22 sqm. Special family staterooms mostly consist of two or three staerooms which are combined with connecting doors. The smallest suites offer up to 39 sqm and the large maisonette suites up to 59 sqm on two decks. All staerooms and suites are modern and pleasant furnished and give you a comfortable home on board. The atmosphere aboard the ships of MSC Cruises is relaxed and casual, with many opportunities for activities. A wide range of sports, culinary highlights and first-class entertainment provide variety. Also on the MSC Grandiosa many families will be on board during the summer months and typical Italian cheerfulness accompanies you on your journey. Those seeking for peace and rest will also get their money's worth on board and can relax in the spa area or retire in many relaxation areas. The cuisine on the ships of the MSC fleet is good and tasty and meets the standard of a good mid-class ship. The restaurants offer variety and fresh cuisine, so every guest on board can find the right thing for themselves. At a surcharge, you can enjoy special dishes and exquisite meals in one of the specialty restaurants. On board, there are many ways to organise your holidays. Relax in the popular Aurea Spa, a luxurious Balinese spa where body, mind and soul come together. A beauty and a nail salon also invite you to pamper yourself. For more active guests, the gym by Technogym® offers state-of-the-art equipment for cardio and strength training as well as innovative courses and training programs. A special highlight on board the MSC Grandiosa is the entertainment program. Colorful shows, musical performances and many activities await you. The new MSC Grandiosa combines the shipping company's popular Mediterranean charm with the most modern amenities of a large cruise ship. Sports enthusiasts will get their money's worth as well as those seeking for peace or families with children. The price-performance ratio aboard the ships of MSC Cruises is good.